Plus, more staff changes in Alameda, and staff cuts announced at Oakland schools. Urban Shield is no more, after county supervisors imposed a variety of new laws. 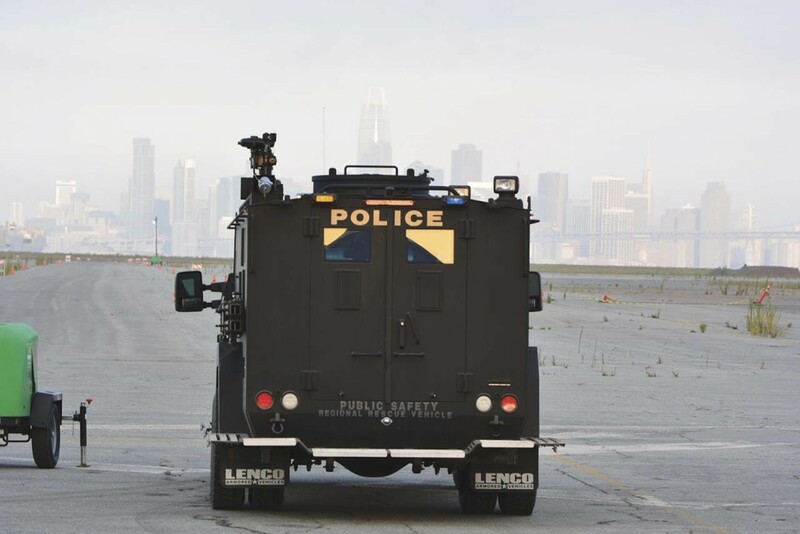 After Alameda County supervisors approved a number of reforms to the controversial Urban Shield training event, the federal government pulled its $5.5 million funding, as if to confirm the warnings that Alameda County Sheriff Gregory Ahern had issued about the reforms. During last week's tense board meeting, Alameda County Sheriff Gregory Ahern maintained that the board's action would likely result in the federal grant being reallocated to another jurisdiction and potentially adversely affect disaster preparedness training for law enforcement in the entire Bay Area and region. "If you accept the recommendations, as I told you 13 times during the last meeting, it will jeopardize the grant and the funding will go away," Ahern warned the county supervisors before their vote. A majority of the board had a different view, however, although some voiced trepidation about approving nearly the entire menu of recommendations offered by its ad hoc committee. Supervisors Wilma Chan, Keith Carson, and Richard Valle supported the motion to accept an agenda item that included changes negotiated between Ahern and the ad hoc committee. But the motion excluded Ahern's request for reconsideration of their action to approve 27 of the 68 recommendations last month. Chan, perhaps the most vocal critic of various aspects of the entire Urban Shield discussion, asked why the board of the Urban Areas Security Initiative had chosen to link funding for the training exercises with the Urban Shield event for the first time in its history. "Somehow these two things became linked and became a problem for everybody," said Chan, who noted the ad hoc committee's task was to focus on aspects of the event's training regimen, not federal grants. She suggested the linkage was the reason for so much confusion over the board's intent within the community. "I don't know why I have to say it again," Chan said. "I'm going to say it three times. No one on this board is against police, fire and first responder training. This is a debate on how these exercises should be conducted." Valle, though, offered a long view on the progress made with Ahern and reforms to Urban Shield, which have become over the years a flashpoint for East Bay progressives who viewed it as vehicle for the militarization of local police forces and an avenue for racist tropes. "The meter has slowly moved in the direction of incorporating ideas that people are bringing forward," Valle said. The two dissenting votes, Supervisors Nate Miley and Scott Haggerty, voiced strong support for Ahern and Urban Shield. "I don't think we should get rid of the baby with the bath water," said Miley, who warned that voting for the complete list of recommendations risked losing the grant funding and putting constituents in danger. In a council referral scheduled for Tuesday night as the Express goes to press, Alameda Councilmember Malia Vella, who is pregnant, is calling for city staff to immediately begin work on finding a permanent area at City Hall for mothers to breast-feed and pump breast milk, in addition to installing diaper-changing tables, and gender-neutral restrooms. If the changes she is proposing are not made before delivering her child this May, Vella said bluntly, "I'll breast-feed at the dais." "We're doing a disservice to working moms and it's a shame for us to be just now catching up with the millennium," Vella said. "It's not an acceptable option to pump in the restrooms," said Vella, who is expecting her newborn this May. "It's basically saying to mothers, 'You're not wanted'"
Absent a specific place to breast feed or pump breast milk, Vella said other City Hall employees have in the past used a somewhat secluded section of the City Council Chambers located at the back of the room where audio and video technicians monitor television and streaming of live meetings. Bringing City Hall up to date regarding the changing gender dynamics in the workplace has been on the council's mind of late. Earlier this month, Vella led the council to adopt a resolution in support of an Assembly bill to extend sales tax exemptions on tampons and other female hygiene products. Change at Alameda City Hall is now complete. Last December, a new mayor and two councilmembers reshaped the City Council with a distinctive progressive tilt. In February, Eric Levitt was named city manager, filling a post unoccupied by a permanent replacement since last May. On Tuesday, the city filled it last major opening by announcing the hiring of Yibin Shen as city attorney. Shen replaces Janet Kern, who retired last December after serving the last seven years as Alameda city attorney. Shen was previously the chief deputy city attorney in Santa Monica. The council is set to formally approve Shen's employment at its Mar. 19 meeting. His first day is scheduled for May 13. For a city like Alameda, which has been embroiled in a housing crisis for several years, Shen's experience in Santa Monica, one of the most progressive cities in the state in terms of rental-housing protections, may be useful. Just last week, the Santa Monica City Attorney's Office celebrated three legal victories, including two convictions, against violators of the city's short-term rental ordinances. He was previously a Land Use and Labor and Employment attorney. Shen will earned an annual salary of $247,000, in addition, to $16,000 in relocation expenses. Mike Siegel, the son of well-known Oakland civil rights attorney and former Oakland mayoral candidate Dan Siegel, is running for a congressional seat in Texas currently held by an entrenched Republican. The district includes North Austin where Siegel is an attorney. Siegel ran for Texas's 10th District in 2018 and was defeated by the incumbent Republican Rep. Michael McCaul. But the race was significantly closer than most political observers ever expected. Siegel is reaching out to his hometown and his father's deep connections with Oakland progressives. Former Oakland Mayor Jean Quan is hosting a fundraiser for Siegel in Downtown Oakland on Tuesday. The Oakland Wellstone Renewal Democratic Club is also sponsoring the event. In 2014, Dan Siegel's mayoral campaign finished third in a large field of candidates.